At the end of the year International Law Journal banquet, the Editorial Staff treated us all to a dinner at Southern Rail Restaurant in Carboro. It was, to say the least, pretty phenomenal. There was a simple salad with a roasted garlic vinaigrette. Dessert was a coffee pot-au-creme with vanilla bean and nutmeg whipped cream. But dinner…oh…dinner was amazing. It was a linguini in a spicy tomato cream sauce with artichoke hearts and tomatoes, topped with a perfectly cooked salmon that had some kind of sweet crust to it. I don’t now how they did it, but it was just perfect. To mirror that, I revamped my usual shrimp, spinach, tomato sauce pasta to try to capture the spicy-sweet aspect of Southern Rail’s salmon pasta. I didn’t know how to sweeten the shrimp, so I just caramelized the onions and garlic. Delicious! 1. Heat the tomato sauce and cream together (put as much cream as you like, really), and season with cayenne until it is sufficiently spicy. I think I put in about 1 – 2 tsp…but that’s because I’m desi. Add it to freshly cooked pasta. 2. Over medium heat, sautee the onions until soft. Turn the heat to high for a couple of minutes to let them brown. Turn the heat back down, and add a pinch of sugar and let them cook until sweet, about 3 more minutes. (My secret quick-caramelize technique). 3. Add the very thinly sliced garlic to the onions (making sure that the heat is on medium. Do not burn the garlic. Do not. Burn. The. Garlic. Do not.) Cook until lightly golden brown. 4. Put the shrimp in a single layer in the pan, nestled in the onions and garlic. Sprinkle with salt and black pepper. 5. 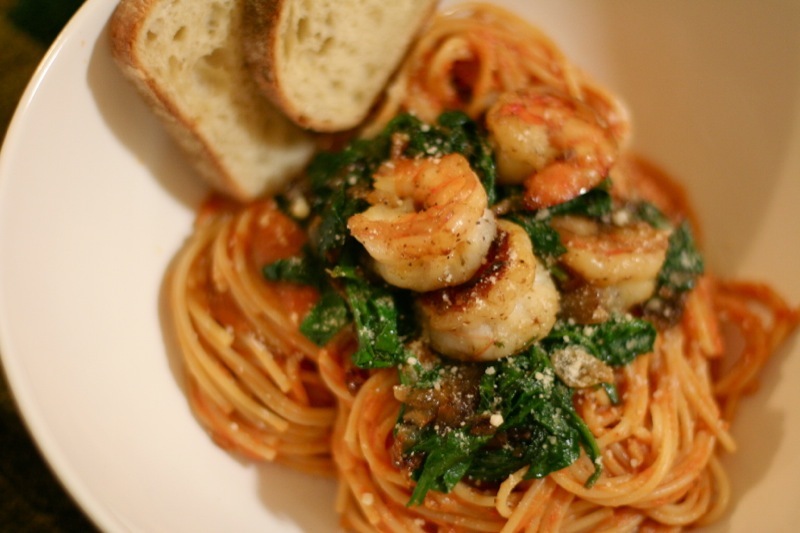 After shrimp are cooked, put in three handfulls of fresh baby spinach and toss to get it all mixed in. Salt it. Cover the pan. 6. Plate your pasta. I’ve finally figured out how to roll it into nests, fancy-like. 7. The spinach should be wilted by now. 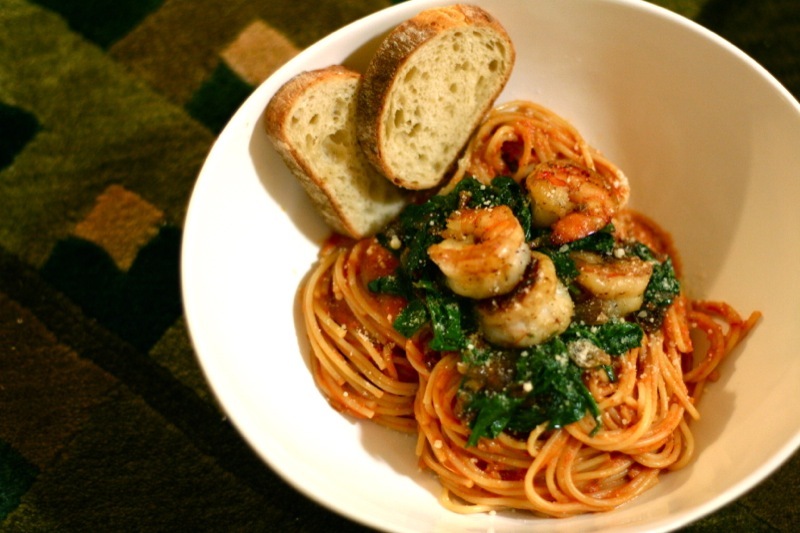 Serve a big spoonfull of garlicky-sweet shrimp and spinach on top of each bowl of pasta. Sprinkle with Parmesan cheese. That shrimp pasta looks good!